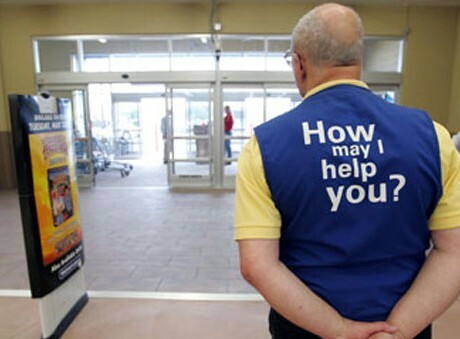 Everytime I go to Wal-Mart I always talk to the greeters at the door. "Welcome to Wal-Mart" they say "Thank you madam/sir. How's the day going?" I say. At first it used to catch them off guard. Cause most people that walk into the store either just look at them or just well, look at them. I don't do that. I talk to them. I ask them about they day, ask them about they kids. We talk about a lot. Sometime they even let me wear they vest for a couple minutes. I love wearing they vest. Feels good. It's one greeter that works at Wal-Mart. His name is Bobby. Now Bobby is 67 and he is a Army vet. This man has as many medals and buttons on his vest that you have ever seen. He is a walking trophy room. Most are not from the Army, it's just buttons and they are awesome. You hear teachers talk about history in your class books. Most people at Wal-Mart can tell you first hand what happen. Stop and talk to them. They would love for you to do that. Basically what I'm saying is make somebody day. Hug them, share with them, ask them questions. Everybody would like to know that at least one person in this world cares about them. Be that person. Set an example for the people around you. It's so many people in this world that is all about them. That's not the way it should be. If you was meant to be alone, you would be born in a egg on a island by yourself. Just you and water. I'm not asking you to do nothing big or buy people things. Just asking that you be nice to the people around you. It goes a long way. Text somebody right now and tell them that you love them. Text somebody you know and tell them that you thinking of them. Why keep it to yourself if you do love/thinking of that person? No reason at all. That's spreading the love. don't just hold it in and wait for somebody else to do it to you. You go first. Spread it. Spreading love doesn't just apply to your boyfriend/girlfriend. As I stated before "Be nice to the people around you". Open a door for people behind you. That's a start. I can't tell you how many times I would be going into a store and it's people in front of me and instead of one person opening the door, they just let it close behind them. It doesn't hurt for you to keep the door open. You will still get to where you going, only 30 seconds later. I always hold the door open. I often run ahead of people in-front of me to open the door. try it sometime. The look on people faces as they walk by smiling and saying "thank you" will make you want to keep doing nice things. It will also set an example for others. They see you do it, they will in return do it. I remember when I was young and was at Pizza Hut. Just plain Pizza Hut and I was playing the arcade games that Pizza Hut used to have. This one man was on a date with a women and I remember that every time the women left and return to the table the man stood up, till she sat down. Every time. From that day on I do it. At the time I didn't know that, that's what gentlemen should do. I just saw a nice man do it so I did it. Leading by example. costs in meeting these needs. you even start contemplating therapy, focus on deterrence to prevent ongoing destruction. elements to avoid wrinkles, even as we have earlier outlined. glasses to protect against squinting and wear an excellent eye cream with sun protection. transition to hypoallergenic items that not cause itching or soreness. daily. Resting with a humidifier also helps in case your skin is normally dry. healthy by including vegetables and fruit within your diet. These have become full of anti-oxidants and can help your body to combat free radicals out and inside. individual ages, these skin proteins are produced in lesser quantities which contributes to the growth of crows-feet, wrinkles on forehead and upper-lip lines. These great collections can be eliminated by utilizing anti aging serums which complement the quantities of collagen and elastin within your body.